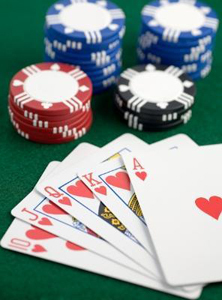 The term "poker" includes an astounding variety of card games, which enjoy a boost of popularity in the recent years. Each of these games has its own set of rules. For example, poker games differ in the number of cards that are being dealt face-up and face-down. Thus, in the popular Texas Hold'em, two cards are dealt face-down to each player and then five cards are revealed in three additional rounds by being placed in the middle of the table. In Five Card Draw, however, 5 cards are dealt face-down to every participant and no cards are dealt face-up. Also, the number of betting rounds varies. There are only 2 betting rounds in Five Card Draw, but there are 5 betting rounds in Seven Card Stud. Despite these differences, all poker games have a few things in common. The action usually starts to the left of the dealer/button. The button position rotates to the left after each hand was played. Some or all of the participants are forced to make an initial bet, regardless of whether they are interested in playing with the cards they were dealt. In some types of poker games, the player to the left of the dealer is forced to place a small blind (half of the minimal bet), and the player to the left of the small bet is forced to place a big blind (a minimal bet). Sometimes, every hand starts with every player at the table placing an initial bet, called an ante. After that, the action completely depends on the player's free choice. Unlike some games of chance, such as roulette or bingo, there is some strategy involved. The player on the left to the button is usually the one to act in all subsequent betting rounds. In every betting round, the player has several choices of action. - Check. The player does not place any bet and passes the action to the next participant. The player can check only if no bets, forced or otherwise, where placed before him. The only exception is the big blind's position in the first betting round. If everyone else called the big blind, the player in that position can either check (thus ending the first betting round) or raise. - Bet. If the player is the first one to play in a new betting round, or if all players before him checked, he can place a certain amount of chips or money. - Raise. If a bet, forced or otherwise, was placed before the player, he can increase the betting amount, making it higher than the previous bet. - Call. The player can also place a bet that is equal to the bet placed before him. If all remaining players call (i.e. – place the same betting amount), the current betting round ends. - Fold. At any point of the game, if the player is not interested to play with his cards, he can throw them away - fold them, ending his participation in the current hand. The player can also go all-in - bet with all his chips or money. If he is called by one opponent only, both of them usually open their cards and wait for the remaining cards to be dealt to see who takes the pot. If the all-in bet is called by two or more people, the pot is split into the main pot and the side pot. The all-in player waits till the end of the current hand and he competes only for the main pot, to which he contributed. The remaining players continue to compete for the side pot, which contains whatever excess chips were placed on the table after the all-in player was called. If all players but one fold, the remaining player wins the pot. He does not have to show his winning cards. However, if two or more players called, a showdown takes place – they open their cards. Whoever has the highest ranking hand, takes the pot. In some games, such as Omaha Hi-Lo, the player with the low hand (if such exists) takes half of the pot. If two or more players have hands of highest and identical value, the pot is equally split between them. Usually, the players open their hand starting from the left of the dealer or starting from the person who probably holds the strongest hand. If someone sees that a hand opened before him is stronger than his, he may muck his card - discard them with revealing. How much can a player bet or raise when it's his turn to act? Several betting limits exist. - Fixed Limit - the player can bet one blind or raise by one blind only. Usually no more than 3 or 4 raises are allowed in the fixed limit poker. - Pot Limit - the maximum raise is the size of the total pot, which is the sum of all the money that was collected prior to the current player's action. - No Limit - there is no limitation to the amount of chips that any player can bet or raise with. - Cap Limit - similar to No Limit. The only difference is the pre-determined maximal pot contribution from each player. When this maximum is reached, no further bets are possible and the game continues as if all remaining players are all-in. To learn more about poker, we encourage you to continue reading about the variations of poker games and how you can successfully compete and win in poker.